Found one file extension association related to Gradebook Power and 1 file format developed specifically for use with Gradebook Power. Gradebook for teachers - teacher developed. 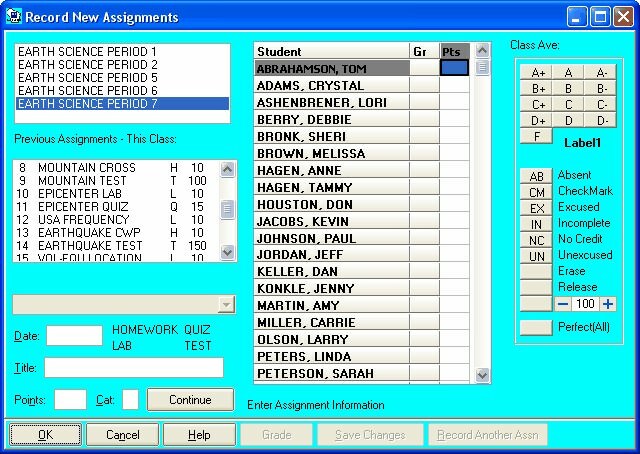 Gradebook Power creates over 40 teacher, student, and administrative reports, attendance, seating charts, Supports block schedule, traditional and trimester academic school years. Allows multiple terms per semester, letter and/or number grades, conduct/citizenship grades, text and numerical comments, non-graded assignments, user categories, discard lowest scores, and optional ID numbers. Many features for elementary and secondary teachers. If you need more information please contact the developers of Gradebook Power (WISCO Computing), or check out their product website.